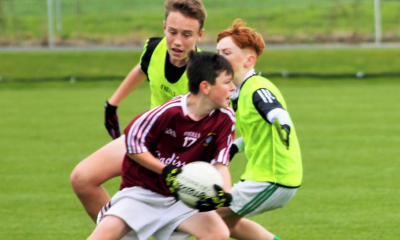 Mick Carley is widely regarded as the one of the most complete and talented gaelic footballers ever to come out of Westmeath. 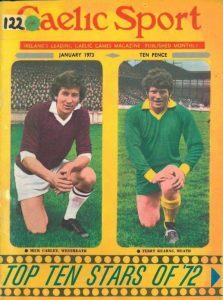 The Tyrrellspass native was an integral part of the Westmeath senior football setup for twenty years, between 1957 and 1977, becoming a regular fixture alongside The Downs Dom Murtagh in midfield. While success wasn’t forthcoming at inter-county level,he enjoyed remarkable success at club level and was a regular at midfield for Leinster in the early 1960s, with whom he garnered his most prized possessions – two Railway Cup medals. At inter-county level, Carley made his senior debut in 1957 and remained an integral member of the Westmeath set-up for 20 years. He had the distinction, shared by only two others, of lining out for both the Westmeath minor and senior teams on the same day in the Leinster Championship, a feat he achieved in 1958. 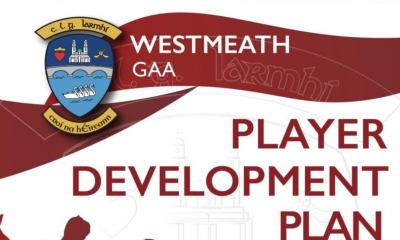 Louth provided the opposition for Westmeath in both games and Mick played both at full back. He also won two O’Byrne Cups in 1959 and 1964 after wins over Kildare and Carlow. 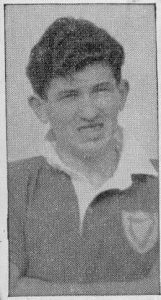 Carley’s performances for his county in those early years were of such quality that he was selected to play for Leinster in the Railway Cups of 1961, ’62 and ’63. By then, he had developed into a top class centrefielder and it was in this position that he recorded his greatest achievements. In the finals of ’61 and ’62, Leinster defeated Munster and Ulster respectively but Ulster exacted revenge in the ’63 decider. It’s worth noting that Mick also had the honour of being selected on the Rest of Ireland team which took on the Combined Universities in 1961. In 1966, he was selected for a tour of the USA, on a team of talented players drawn from the so-called ’weaker counties’ of that era. These games were known as the Cardinal Cushing Games. 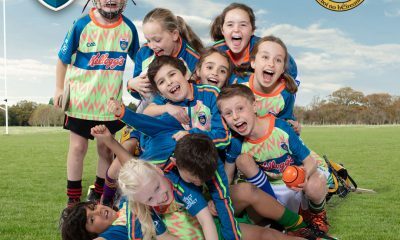 After completing his primary education at Tyrrellspass National School, Mick attended St. Mary’s CBS, Mullingar where his immense footballing talent first came to notice. Whilst in First Year, he used to look up to a Leaving Cert student named Frank O’Leary. O’Leary, whose father was a Garda Superintendent, was St. Mary’s star player at the time and later went on to enjoy distinguished inter-county careers with Westmeath, Kerry and Mayo. 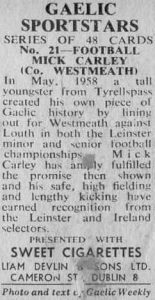 Carley didn’t leave St. Mary’s empty-handed – he won a Leinster Colleges Senior ’B’ medal in 1955 at the expense of St. Peter’s, Wexford. 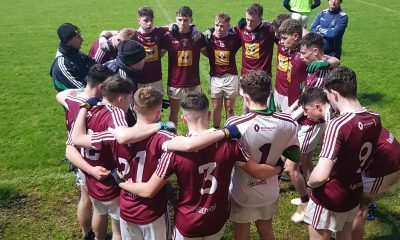 At around this time, he was also part of a successful Under 17 Championship-winning team, which was an exclusive underage club based in Kilbeggan. Mick’s adult career began in earnest in 1956 when he broke onto the St. Mary’s, Rochfortbridge intermediate team. Two years later, he won an Intermediate Championship memento with the ’Bridge before embarking on a new club career with the Mental Hospital (now St. Loman’s). Mick’s career blossomed with the Mullingar outfit and he was an inspiring figure on their County Senior Championship-winning teams of 1961 and 1963. In 1968, Carley joined The Downs, then an emerging force in senior football. 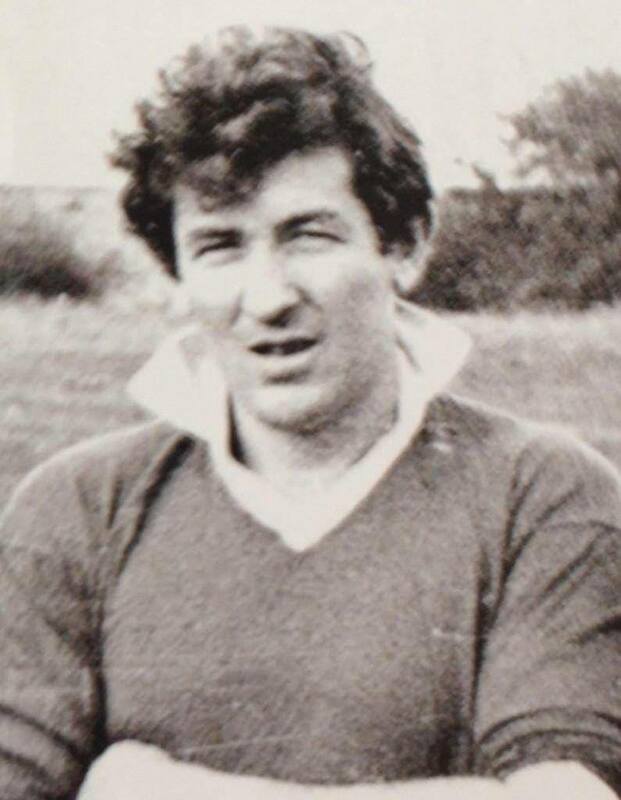 He played with them for seven years, winning five Senior County Championships in ’68, ’69, ’70, ’72 and ’74. In the two latter years, he captained the team. He would also have captained The Downs to provincial glory in 1972, had they not lost the Leinster Club Championship decider to Dublin kingpins, St. Vincent’s. 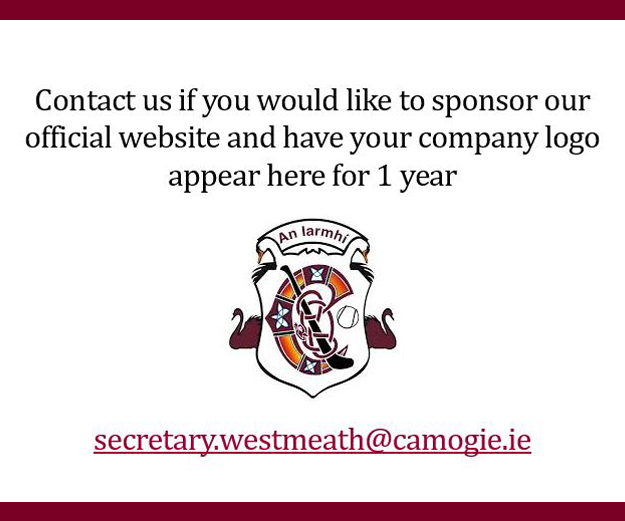 One of Westmeath’s first truly gifted players. 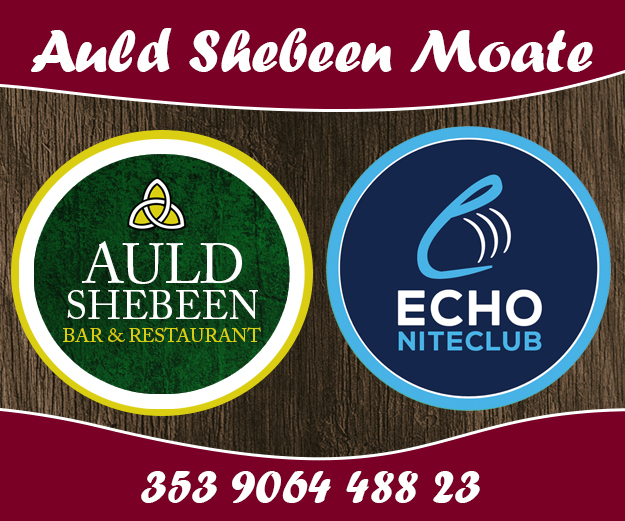 Ar a dheis Dé go raibh a anam.